See NEW VERSION on Fourth Annual H.264/AVC comparison page! Also see Selected Comments for First Annual MPEG-4 AVC/H.264 Video Codecs Comparison! We would like to thank Moonlight Cordless LTD, Fraunhofer Institute for Integrated Circuits IIS and Ateme for kindly providing us their codecs for this test. Adding more H.264 codecs to the comparison. The main idea is to compare the results provided by the new codecs when they are used by an ordinary user for home video compression. As a rule, such users prefer simple and popular programs to play DVD movies or digitize signal from tuner. Also they rarely change default codec's settings. We understand that it is very hard to create codecs that would work well on different sequences using the same settings, but this situation is rather common. Taking the peculiarities of H.264 standard into consideration (such as long time of coding when all possibilities are used) we are going to use 2 presets: "tuned" and "fast". First one is used to get maximum quality, second one is used to ensure fast processing. These presets will be provided by the codecs developers. Both time and quality will be measured. This will allow codecs to show their possibilities in terms of quality and us to compare speed in a more correct way. Comparison in Y-PSNR, U-PSNR and V-PSNR metrics. Bit rate handling (does your movie fit on the CD?). PSNR - is a metric used to compare 2 pictures: the more per pixel difference between the pictures is the less is PSNR value. We use the average value of the per frame PSNR metric to compare two sequences. So the higher is the codec's line on the graph the better is the quality of compression performed by this codec. 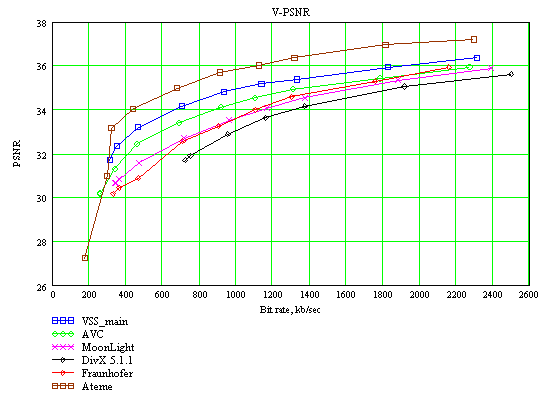 Y-PSNR is the difference in brightness component, U-PSNR and V-PSNR are the differences in hue components. On this picture V-PSNR values are shown. The higher the line is the better is the quality. In most cases the PSNR value is in accordance with the compression quality. But sometimes this metric does not reflect presence of some important visual artefacts. For example, we can't estimate the quality of the blocking artefacts compensation performed by some codec using only PSNR metric. Also in some cases it is difficult to say whether 2 dB difference is significant or not. That is why we use visual comparison of some frames in addition to the PSNR images. This won`t help us to understand the whole situation, but will allow to demonstrate some interesting features of the codec (e.g. block artifacts compensation). 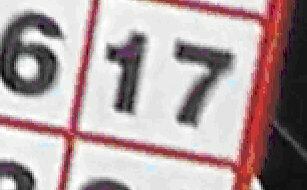 These pictures present the same frame compressed by two different codecs with the same bitrate. One can see that Ateme H.264 codec provides a better compensation of the blocking artifacts.